"These lightly sweetened raisins and whole grain flakes come with 100% of the Daily Value of 11 important vitamins and minerals. This means you're getting a healthy dose of nutrition with a healthy dose of flavor. Wake up your taste buds every morning with the delicious taste that gets you going in no time." "Introducing Post Raisin Bran. Other raisin brans have only one-fourth as much vitamin nutrition and eating a raisin bran with only one-fourth the vitamin nutrition you could get is like having Mount Rushmore with only one president. New Total Raisin Bran is the only raisin bran with 100% of 11 vitamins and minerals. Total nutrition has finally come to raisin bran." 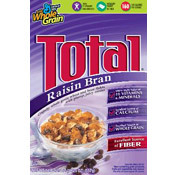 What do you think of Total Raisin Bran? View all 47 comments for this cereal. 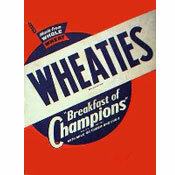 Was better than Kellogg's or Post's Raisin Bran. Better texture to the flakes. Wish it would come back again. Please, please, pretty please! Bring it back! I miss this cereal, nothing else compares to it. The best cereal ever. Bring it back! Plain is just not the same. I can't find Total Raisin Bran in any store nor anywhere on the internet. We've tried all the other brands but none are as good as Total. Best Raisin Bran. The flakes stay crisp and the raisins are moist. All other Raisin Brans I've tried, the flakes quickly become mush and their raisins are hard. When will this be back on the market. Best cereal I've eaten in my 67 years. I hate that this is not being made anymore. It was one good thing I knew I was eating. Please bring it back! Best cereal ever. No soggy flakes!